How Does Your Horse Rate Your Feel? Immerse with your Horse... yum! What is your horsemanship goal...? What's your dream...? What keeps you up at night...? What’s true for you? Does your sensitive horse get tense at times? Does your confident horse get resentful at times? Does your horse seem to be “going through the motions”? Do you keep revisiting the same challenge? Do you sometimes feel like you are "confronting" your horse when things get challenging? Do you doubt that you are a genuine "Alpha" or “boss” at heart (and your horse knows it)? What if you could take your horsemanship skill to where it is not necessary to "push through" the brace? What if solving a challenge not only feels good to both of you in the process, but also adds trust and meaning to the partnership as a direct result? Make a quantum leap in how your horse rates your Feel to unlock your next level of partnership. Understand the Facets of Flow and how to apply a collection of small, practical changes that will have a big impact on your horse, your training and your results. FRIDAY: Fuel for a Fast Start! What does your lead-line mean in terms of true Feel, from your horse’s point of view? How does this relate to your reins? Four distinct types of Feel occur in your lead-line and reins. Each one directly impacts your horse’s posture, balance and quality of movement. Learn the differences, how to apply them on the ground and under saddle, so you can ensure you support your training from the stable to the mounting block as well as during your ride! By the end of Day 1, you will be practicing a collection of small changes that will have a big impact on your horse's capacity to be mentally and emotionally available, while helping him move gracefully and remain at ease. 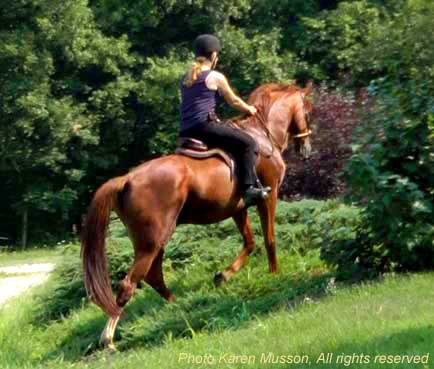 We have trouble with canter departs or maintaining the canter  Why does my horse go too fast? Why won’t my horse go faster? A BIG reason for this is the influence we have on Foot Flow without true awareness! The flow of your horse’s feet taps right into his instincts, holding deep meaning for him, so guiding this through feel can be so very useful! Foot placement is also a key influence on his posture and shape, which determine the quality of his next maneuver. Learn why guiding Foot Flow can improve your timing by 75%, manage the feel of the connection as well as speed – and it’s NOT rocket science! By the end of Day 2, you will have gained the skill to carry feel through to the feet in easy increments and in a way that has natural meaning for your horse. As the old saying goes "brace on brace empowers the brace" - the Feel we offer defines the partnership because that is the main thing the horse has to go on. If, as Bill Dorrance says “It’s in a horse’s nature to get along” why does my horse sometimes resent our efforts or stay tense or get lazy or seem indifferent? We explore what no-one is talking about because it is the current “normal” and what we are doing together to change that so we can heighten our enjoyment! One exercise with many exquisite layers to assess how a horse will travel left, right, straight, the quality of transitions and strength of connection you can expect when you ride and improve all those elements… in two steps. No tricks, just Particles of Feel. By the end of Day 3, you will understand the elements of true connection rarely understood or experienced and how to continue shifting from a strategy of brace (correcting against the flow) to one of Grace (directly influencing flow). We invite you to Come Ride! A shift in your Feel & Timing to better fit your horse can be enough to unlock your next level of partnership. What's in your Feel defines your partnership. Why? Because Feel is the main thing your horse has to go on - it's how he's "wired". This means Your Feel is the direct line to your horse - when applied with clarity that fits Your Horse.